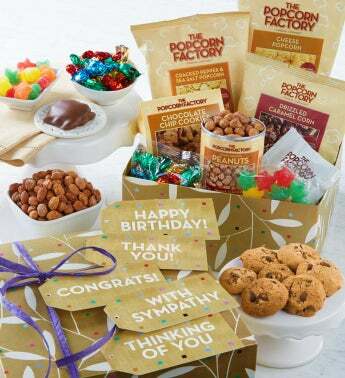 We fill our popular gift box with Honey-roasted Peanuts, Chocolate Chip Cookies, Sour Stars, Hard Sour Candies, 2 Pixies® and 3 flavors of popcorn: Cheese, Drizzled Caramel and Cracked Pepper &amp; Sea Salt. Choose from five different sentiments: Congrats, Happy Birthday, Thinking of You, Thank You and With Sympathy. 1lb 4.7 oz.Serves 2-3.